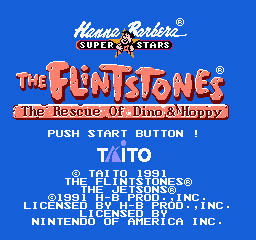 The Flintstones: The Rescue of Dino and Hoppy is an NES game featuring everyone's favorite modern stone-age family. 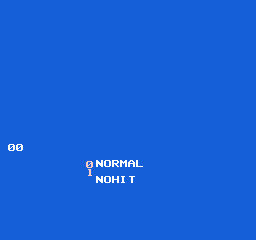 The game stores a sequence of button presses in memory at the title screen, but jumps right over the code that checks them! To reactivate the routine, enter Game Genie code SKKALTIZ+VEKAGTNA (SKKELVIX+VEKEGTNA in the European version). Alternatively, to jump straight to the debug menu, use KKKALTIX+VEKAGTNA (KSKELVIZ+VEKEGTNA in the European version). After the codes are entered, wait for the "PUSH START BUTTON!" text to appear, then press Up, Right, Right, Right, Down, Down, Down, Down, Left, Left, Start. If you mess up while entering the code, press B to start over. 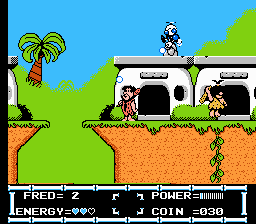 Fred will pass through enemies unharmed, and will start with all three special abilities (FLY, JUMP, and DIVE). FLY and DIVE can be used for free, provided you have enough coins to cover the usual cost. Pressing B on Controller 2 will freeze or unfreeze the game; while frozen, tapping A will advance the game frame-by-frame (or you can hold the button for slow-motion). Press Up on Controller 2 to end the current level and mark it as "passed" on the map screen. After selecting one of the two options, a number will appear, which acts as both a sound test and scene select. Press Up or Down to change the number, A to play the selected music or sound effect, B to stop it, or Start to start the game at the selected scene. 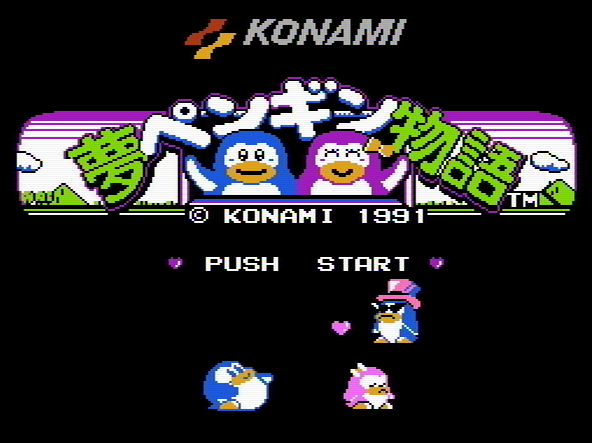 The Japanese version of the game has the cheat sequence enabled, though the code itself is different. Wait for the "PUSH START BUTTON!" text to appear, then press A, A, B, B, Right, Down, Down, Down, Down, Down, Down, Down, Left, Start. Everything else works the same as the US version. 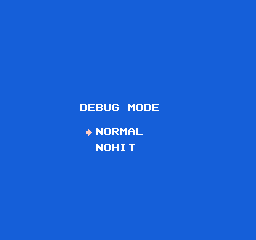 In addition to the debug mode, the Japanese version has a "Test Mode", which skips the "NORMAL/NOHIT" portion and just goes to the stage select/sound test. To access it, wait for the "PUSH START BUTTON!" 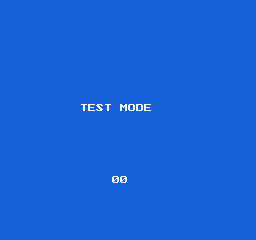 text to appear, then press A, B, A, B, Up, Right, Right, Right, Down, Down, Down, Down, Left, Left, Start. The game contains a fully-coded and functional enemy that is never used anywhere. It is a variation of the enemies in the final stage that bounce around on springs. The difference is that this one hovers in the air in a swooping motion and fires a gun in three possible directions. Get better rips of some of these. A number of unused sprite graphics are present in the ROM, though none of them seem to be associated with any actual code anymore. A large number of these were removed from the later Japanese release, including the dragon, fan blades and bolts, tilted logs, and the snail shell. 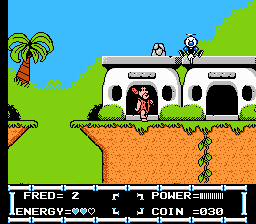 Apparently, the little Fred at the top of the title screen was supposed to be animated. No code has been found to display the extra frames, though. A dialogue sprite for Fred. Since he has absolutely no dialogue in this game, this goes unused. A boomerang weapon pickup. Oddly enough, this is stored below the time machine part ("TM") sprite, and is not in the 8×16 format used by the rest of the game's sprites. The small blobs fired by the blue snail enemies were originally supposed to have two frames of animation; however, in the final game, they only use the left half of the first frame. Propeller blades and bolts that were clearly intended for the final stage, which takes place in the future. Either a pincer claw or a platform, also intended for the final stage. A waving flag or banner (or possibly a carpet) and an exploding molotov cocktail. Neither Fred nor any enemy has such a weapon. A weird goblin head that would apparently pop out of a hole and spit something at the player. A martial artist character and a giant fireball stored with all the other graphics for the Asian village stage. The log platforms carried by the pterodactyls were originally intended to tilt, but they remain completely horizontal in the final game. This appears to be an early version of the Sabertoothed Cat enemy. A Sabertoothed Cat does appear in the final game, but it looks completely different from this one. Although this shark would have easily fit in with the underwater stage, it is nowhere to be found. A giant snail shell that would roll. Fred occasionally rides an object through part of a stage and that is likely what this was intended for. 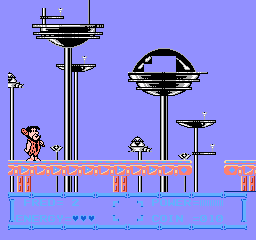 Not technically "unused," but hidden: in the final stage, changing the background color reveals some previously unseen details in the tall structures, which may indicate that the background was not originally supposed to be black.